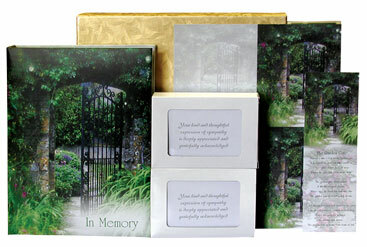 Lewis Funeral Home offer a wide selection of Register Books. We have a selection of several designs, for you to choose from. 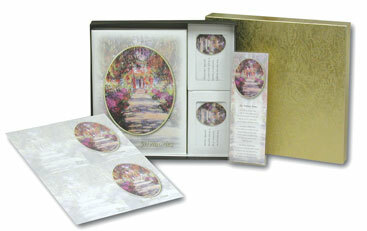 Please take a look at the designs that we have available. 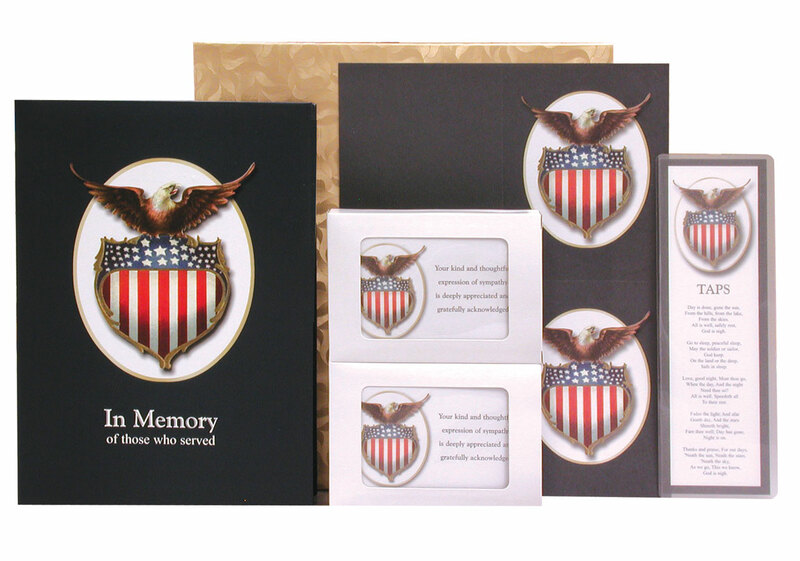 The Veteran Box Set, from our Premium Series, features an eagle with spread wings gripping a shield bearing the stars and stripes. 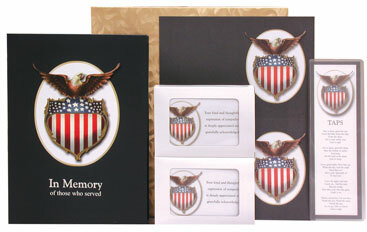 The eagle not only represents the United States, but also embodies the ideal of fearlessness. The bold red, white and blue of the stars and stripes evoke a sense of pride and devotion to one's country. 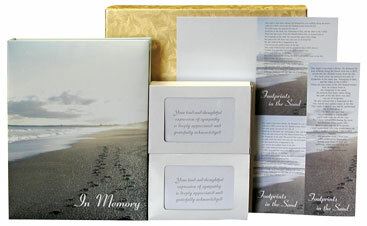 This gift box set includes all needed stationery items for your loved one's funeral service. Included are a Register Book with Full-Color Pages, 50 Acknowledgements with envelopes, 100 Service Records, Laminate Bookmark, Writing Instrument and Floral Envelope. 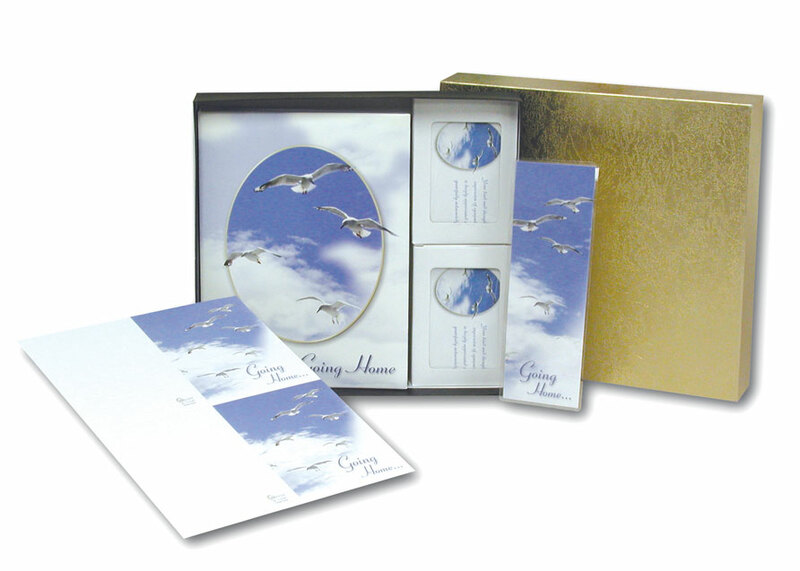 The Going Home Box Set, from our Premium Series, features the background of a pristine blue sky and ethereal white clouds offsetting the free flight of a flock of white birds. It is a beautiful full color representation of a spiritual return home. 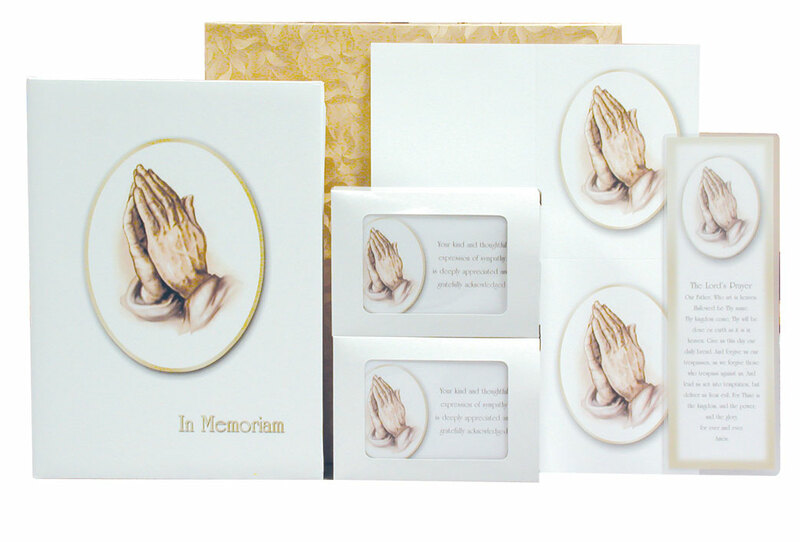 The Praying Hands Box Set, from our Premium Series, features sepia toned hands folded in reverent prayer and exudes a sense of peace and comfort found only in times of prayer. 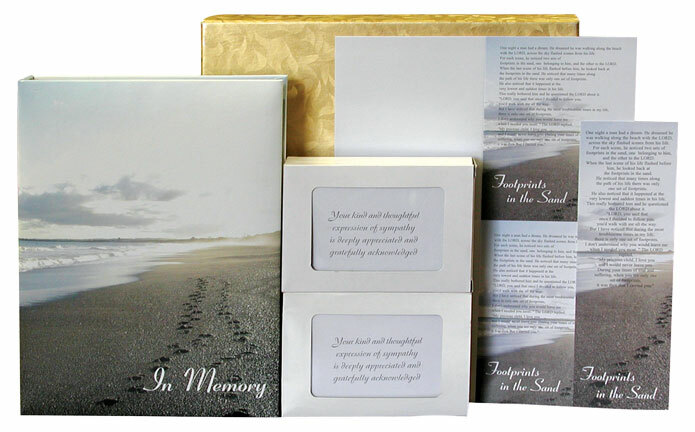 The Footprints Box Set, from our Premium Series, features a photo representation of the story told in the "Footprints in the Sand" poem. A sea shore stretching to the horizon with two sets of footprints in the sand is an image that immediately brings the poetic story to life. 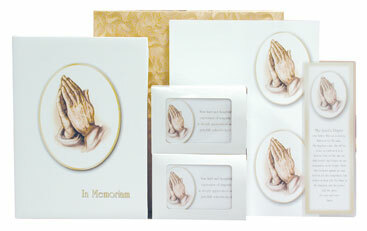 This gift box set includes all needed stationery items for your loved one's funeral service. Included are a Register Book with One-Color Pages, 50 Acknowledgements with envelopes, 100 Service Records, Laminate Bookmark, Writing Instrument and Floral Envelope. 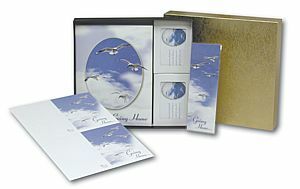 The Dove Box Set, from our Premium Series, features a dove in flight. 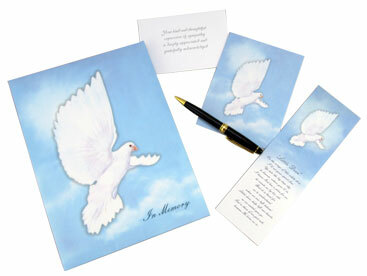 The dove historically represents freedom, peace and the Holy Spirit. 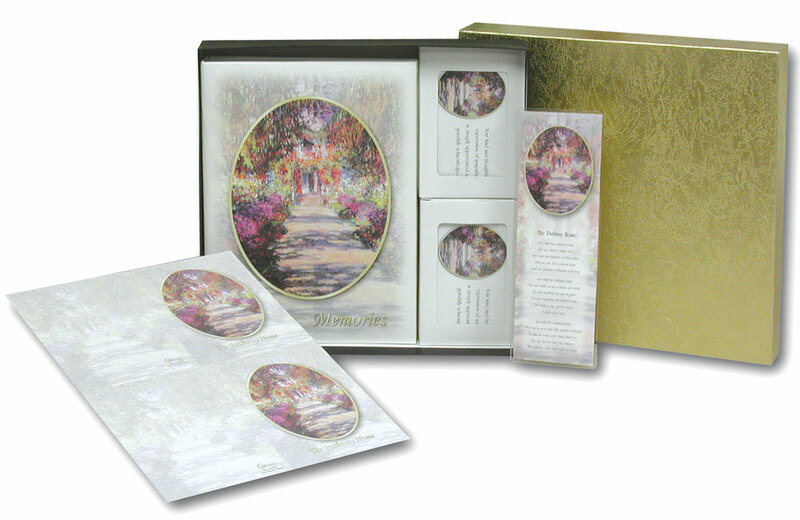 The Pathway Home Box Set, from our Premium Series, features the painting Pathway in Monet's Garden at Giverny by Claude Monet. Displaying Monet's classic French Impressionist style, the brilliant colors of the garden path represent the untold beauty of the soul's spiritual journey home. 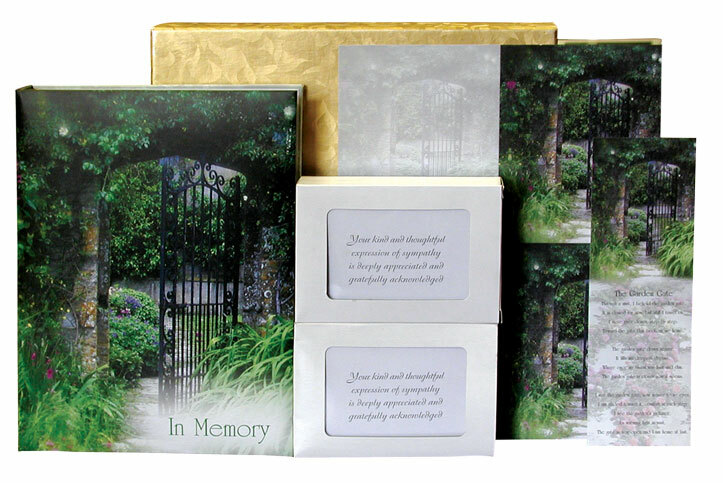 The Garden Gate Box Set, from our Premium Series, features a beautiful photo of the partially open gate leading into a secluded garden. The lush greenery surrounding the gate, and beckoning from beyond the gate, gives the sense of comfort and of being home. 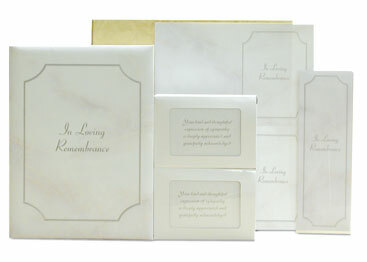 The Remembrance Box Set, from our Standard Series, features a simple and timeless design on a classic backdrop of elegant white marble.